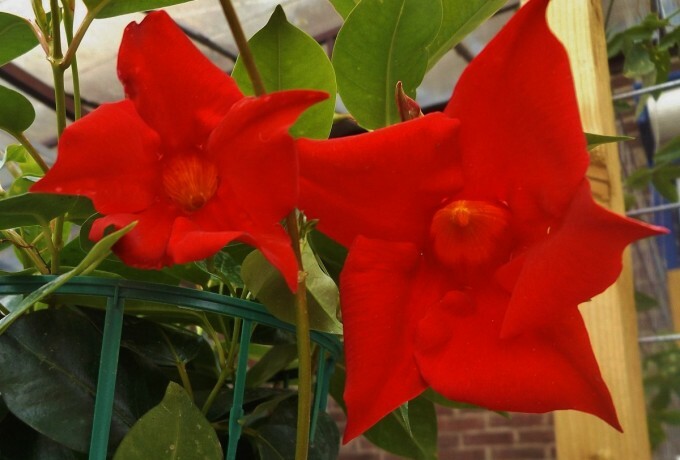 #2, Dipladenia Sanderi "Sundaville Red"
The beautiful red vine we bought last Spring died 2 weeks before it was warm enough to go back outside on the patio. I am giving up on house plants. I was never that good at keeping them alive, no matter how much I nourished and nurtured them, or not, depending on the given instructions. Again, I have been given confirmation that all my efforts have been in vain, as the Sanderi, that up until it was brought indoors for the Winter, was in full glorious bloom, slowly and steadily, gave up on life and wilted, withered and turned brown until come Spring this year, it died just as the sun came out.